Easily increase access around the home for wheelchairs and other mobility aids. This robust folding wheelchair access ramp is ideal for providing access to houses and cars for wheelchairs, scooters, walkers and rollators. 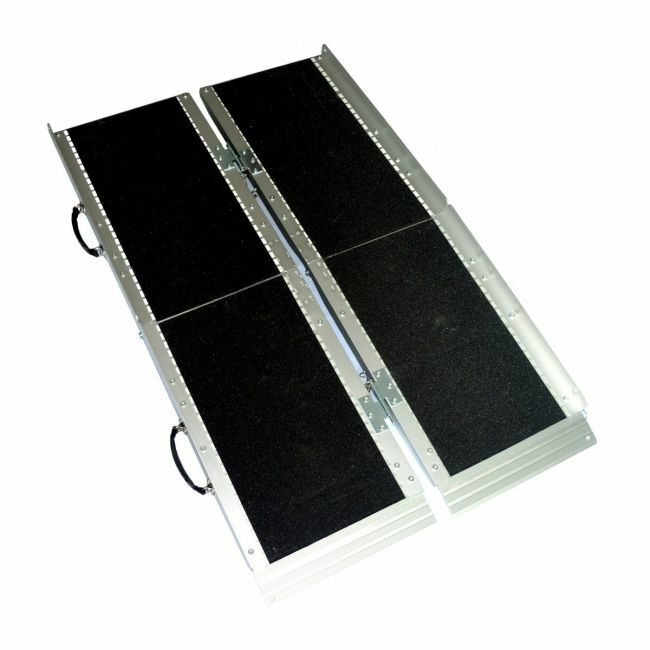 At just 11kg this wheelchair ramp is lightweight, yet can support a maximum load of 42 stone. You may need to drill a hole on your step to secure this ramp. The pin can also be used with another hole to hold them closed when folded for storage or transport. The ramp is supplied in two parts that can be easily slotted together and secured with the supplied pin. Please check all the measurements of the ramp and the place it is going to be used before purchasing to check it will fit. Please also check that the length of ramp you order will not be too steep for the intended use.